If you like chocolate cookies & love the taste of Mars Bars – you will totally flip out over these Chocolate Mars Bar Cookies!! I could keep you in suspense no longer. I may have mentioned my particular preference for a cookie with my cuppa? 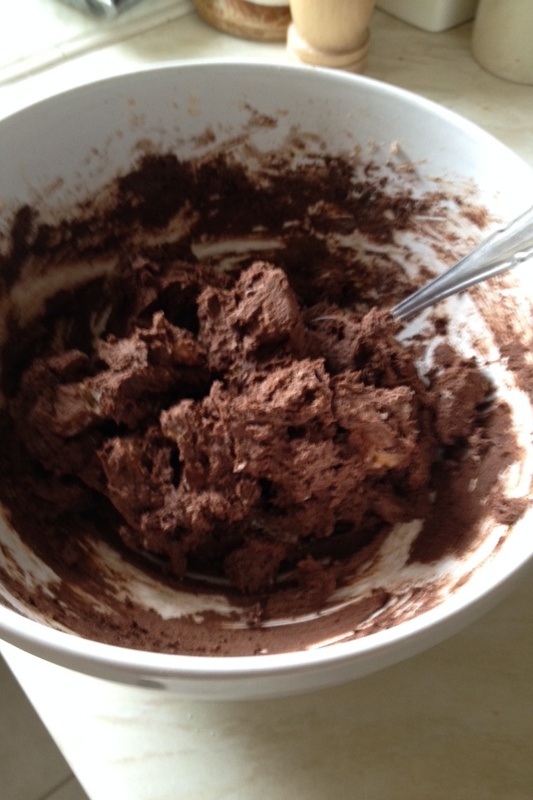 This combined with my natural curiosity led to these Chocolate Mars Bar Cookies being made. But, if I’m going to completely truthful, I had an ulterior motive for making them!! More on that later. I do apologise I have not yet said hello & good morning to you. I hope you are well today & encourage you to read yesterday’s blog: more food for the soul, than for our tummies & definitely way more important. I hope it makes you think, question, wonder & seek. Today the rain is lashing down, giving the gardens a well needed dousing. Tomorrow the sun is supposed to shine, YAY! 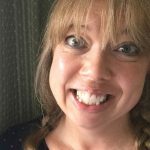 Sunshine always seems to make people seem brighter & happier – listen to me! English & talking about the weather – I’m a stereotype!!!! I promised you my reason for the ulterior motive behind these cookie. 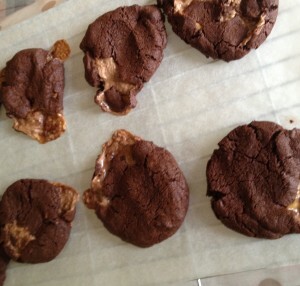 Well…… I also made PEANUT BUTTER SNICKERS COOKIES which I absolutely lurve – I will post that recipe soon! 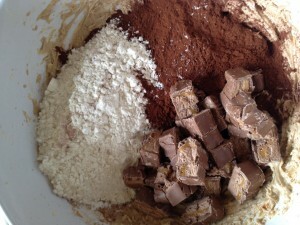 Making the Chocolate Mars Bar Cookies keeps my lil kiddly winks away from the Snickers Cookies! They prefer chocolate Cookies over any other!!! I know, I know I go on about sharing & I do. I really do! I shared the Snickers Cookies with my special QC friend! The gorgeous dark brown sugar gives these cookies a fudgier flavour!!!!!! 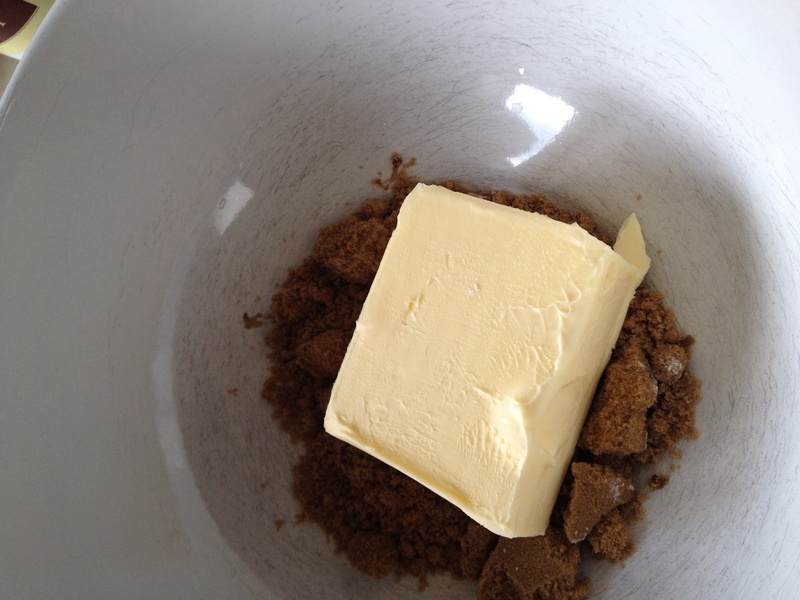 Place the sugar, butter & salt into a bowl. Whisk or beat until light & fluffy. Add in the egg yolk & Vanilla Extract. Whisk or beat until fully incorporated into the butter/sugar mixture. Naughty – I didn’t sift my flour/cocoa – whoops!!!! Next add the flour & cocoa ( you can sift them in if you prefer) & the chopped Mars Bars (don’t try to sift them – just trying to be helpful!!!!). Slowly mix until all the ingredients are thoroughly incorporated together – it is inevitable that during this time the chunks of Mars Bar break up a bit, DON’T WORRY!!! This just adds to the gooey texture of the cookies! 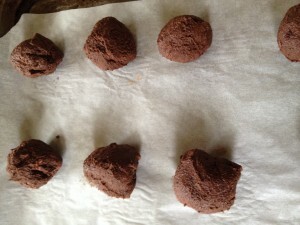 Take a desert spoonful of the mixture and roll into a ball using your hands. The ball should be approx 1″ across, add or take away cookie dough to get the right size. Cookie dough balls, ready to be lightly squished!!! Make 16 balls, as above & place 8 on each cookie sheet, evenly spaced as they will spread on baking. With clean hands use your fingers to gently flatten each ball. Place in the preheated oven & cook for 10-13 mins (depending on size of cookies & oven). 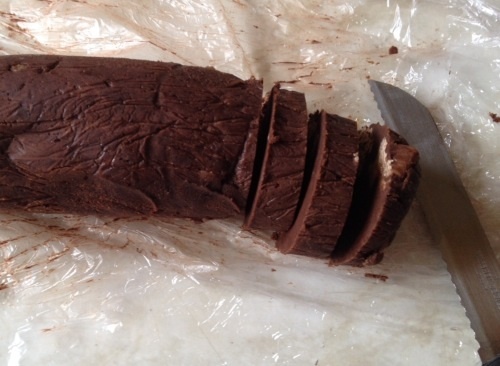 WITH THE REMAINING COOKIE DOUGH: Place onto a long piece of cling film, gently roll into a log shape. Cookie dough log removed from fridge & left to warm for 20 mins before slicing. Wrap thoroughly in the cling film & refrigerate for up to 4 days, double wrap & freeze for up to one month. When ready to use, thaw in the fridge, overnight, if previously frozen, then remove from the fridge 15-30 minutes before slicing into 1/4″ thick discs. With cocoa in the dough mixture it can be difficult to tell when the cookies are cooked: Firstly, don’t be surprised if some of the Mars Bar chunks burst from the edge of the cookie & bubble away – this is fine. They will easily come away from the parchment paper when cooled (hence the need for parchment paper, so you don’t have to use a knife to scrape your non stick baking sheets!!!). The cookies will be set around the edge & although still soft to the touch (they will harden in cooling) each cookie will have a fixed shape & have a dull surface (not shiny where the butter & sugar are still baking). It’s very hard to give an exact cooking time for these cookies due to the inherent variations of the cookie size & different ovens. My suggestion would be to remove them from the oven if they fulfil the above criteria & to DEFINITELY not cook them for longer than 13 mins. 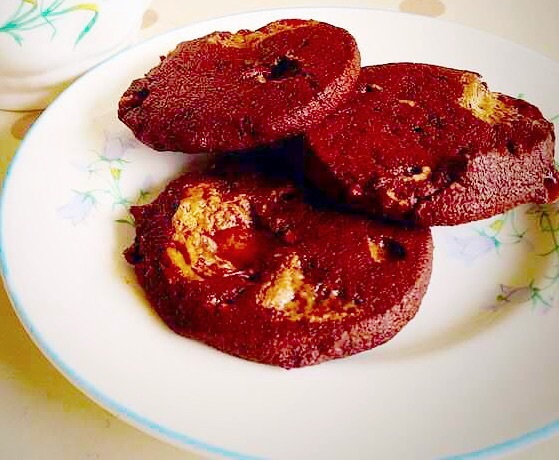 The large proportion of Cocoa will result in a dry, claggy, stick to the roof of your mouth Cookie if over cooked. 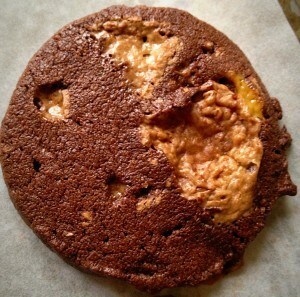 Better to have a soft chewy, slightly undercooked Cookie. Remember Cookies are not like cakes! Once cooled & hardened if you feel they really are too undercooked, pop them back into the preheated oven for a couple more minutes. This should finish their cooking! 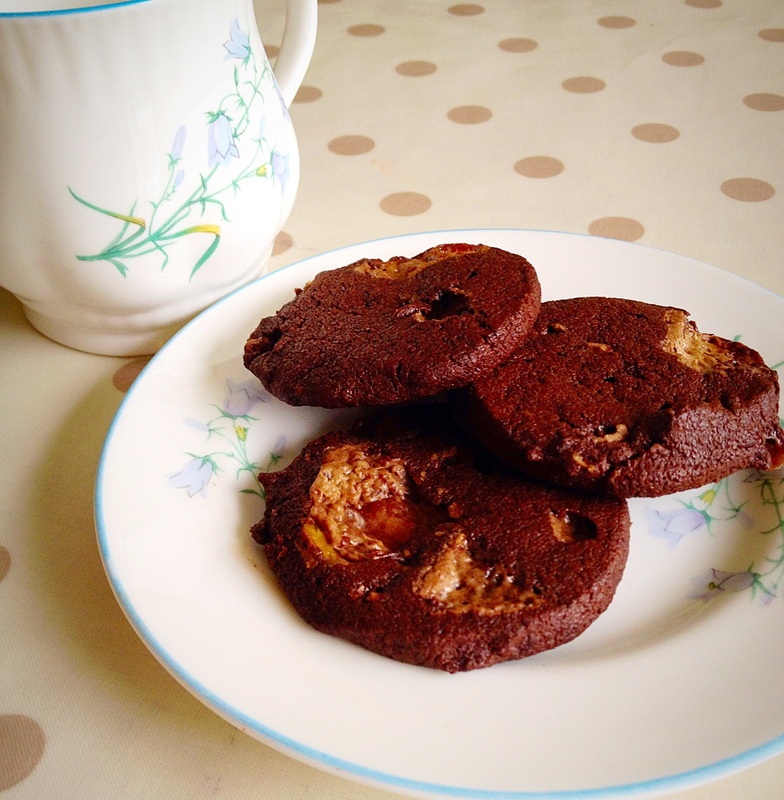 Chocolate Mars Bar Cookies, made for sharing! These cookies are at their best the next day after making (I’m sorry) but they still taste good once cooled!! They make excellent gifts: Pop a few in a cellophane bag, tie with a pretty ribbon or rafia, or place in a pretty tin for a larger gift. We don’t have to wait for special occasions like birthdays or Christmas (although these are always good opportunities to share & give). Have you ever been surprised by a gift, just because someone wanted to show you they cared? If not, why not start a new tradition? I know of a church, in Devon, who buy lots of Easter eggs & give them out to the businesses of their small town as a thank you, for the services the businesses supply to the townsfolk throughout the year!!! What an amazing idea! Sharing is contagious! Now what I am ABSOLUTELY NOT saying is that we should give to receive. Only that by giving & sharing we are showing others & they in turn may go on to share. A SHARING REVOLUTION : imagine the difference & smiles that would generate? Everyone SHARING FEASTING AND HAVING FUN!